Harris-Teeter had whole chickens marked 35-cents a pound this morning. 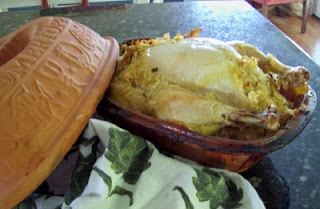 I used the first to make my favorite roasted recipe from The Clay Pot Cookbook. You need a Romertopf or similar terra cotta cooker, which I often see at yard sales for a buck or two. The absorbent clay steams the chicken in a delectable way. Use brown rice instead of white because it makes for a chewy stuffing. I can't reprint the recipe exactly; I omit sherry and other ingredients! However, here is a basic method for a mouthwateringly delicious bird. 1) Soak the clay cooker for 15 minutes. Do NOT preheat the oven! 2) Put 1 cup brown rice in a pot with 1 3/4 cups of chicken broth and bring to a boil. Cover and simmer for 20 minutes. 3) Meanwhile, dice a whole onion and/or a handful of shallots. Add a teaspoon of parsley and sage. Mix all of this with the rice and liquid. 4) Salt the whole chicken and stuff the cavity with rice mixture. I like to set the chicken on a bed of carrots. 5) Put the covered cooker in a COLD oven and set it for 480 degrees. Lift the lid at 80 minutes. If desired, baste and cook uncovered for another 10 minutes. My cooker is small, so the skin of my chicken sometimes sticks to the top, eliminating the last step. I had a clay pot cooker when I was young and foolish. I gave the thing away......I have something to add to my thrift store shopping list!! I remember what wonderful dishes came from that cooker! Mouthwatering, tender and delicious. Thanks for the reminder. hmmm, I've never tried one of these. . . . I'll keep the old thrift store/yard sale eyes open! It looks and sounds delish. I wonder if it's regional; I haven't seen these in my thrifting journeys ... but I'll be watching. Looks like something that has earned a space in the cupboard. Anyway, you just convinced me to keep my clay garlic roaster. I have the TOP to a clay chicken pot just like yours. I've had it (my uncle gave it to me) for four years and have yet to find a whole one, let alone a bottom. There must have been a store in my city which sold them, because I see them more often than not. I think a lot of shoppers just don't know what they are?